Ironically, the last original-recipe (plus or minus D'arcy) Smashing Pumpkins album was a free download called Machina II. It's ironic because the first reborn Smashing Pumpkins (SP2) album - Zeitgeist - has been repackaged so many times, and one of the album's singles has been shilling for "A Sick System" - or is that "A Sync System"? Machina II was an F-YOU to the major record companies, and Zeitgeist has been hijacked by the same industry - a dying industry desperate for money. Currently, this is Zeitgeist, though I'm missing a few versions on this list: Red Zeitgeist, red book Zeitgeist, yellow Best Buy "Death from Above" Zeitgeist, green UK Zeitgeist, blue iTunes "Stellar" Zeitgeist, violet Target "Zeitgeist" Zeitgeist, silver Best Buy "Death from Above" / "Stellar" / "Ma Belle" / Inside the Zeitgeist documentary Zeitgeist, and now blue "explicit lyrics" iTunes Zeitgeist / American Gothic / music videos bundle. Whew! 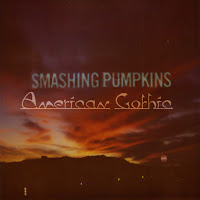 With that said, SP2's acoustic-ish Zeitgeist EP American Gothic sounds pretty good. It's almost like an alternate universe where Billy Corgan and Jimmy Chamberlin recorded songs for Into the Wild, instead of Eddie Vedder. More accurately, this is what the Adore album might have sounded like with Jimmy Chamberlin and with the original rumor of an acoustic post-Mellon Collie album. Super Zeitgeist is too large to fit a standard 80-minute CD. You can buy a DRM-free mp3 album of Zeitgeist at Amazon.com, otherwise the bundle is for sale at iTunes . You'll have to track down the bonus tracks "Death from Above," "Stellar," "Ma Belle," and "Zeitgeist" elsewhere.